Toyota Motor Corp. U.S. sales of Prius hybrids reached a record in March and in the first quarter, propelled by higher gasoline prices and two new models. Toyota sold 28,711 units in March of the Prius “family,” now comprising a plug-in Prius and c subcompact, the original hatchback and v wagon. Prius sales surged 54 percent from a year ago, and topped the previous monthly best of 24,009 set in May 2007. First-quarter sales for the world’s best-selling alternative powertrain car keeps Toyota on track to meet a goal of 220,000 Prius sales in the U.S. this year, up from 136,463 in 2011. The vehicle accounts for half of U.S. hybrid sales. First-quarter Prius sales were 60,859. The model’s best previous quarter was April-June 2007, said Celeste Migliore, a spokeswoman for the company’s U.S. sales unit in Torrance, California. “Toyota’s move to raise the price of their bigger Prius models is a good sign that the company is trying to make the models more profitable, too,” Aoki said, citing the carmaker’s planned $150 price increase for the v wagon model. Hybrid sales typically track the cost of gasoline, rising in line with pump price increases. Regular grade gasoline cost an average of $3.92 a gallon on April 2, up from $3.28 at the end of last year, according to AAA’s Daily Fuel Gauge. “Fuel economy remains a top purchase consideration among consumers, and we are pleased with the continued response to Toyota’s lineup,” Bob Carter, group vice president of U.S. sales, said in an e-mail yesterday. The original Prius hatchback and the Prius c are rated as delivering an average of 50 miles (80 kilometers) per gallon in combined city and highway driving by the U.S. Environmental Protection Agency. 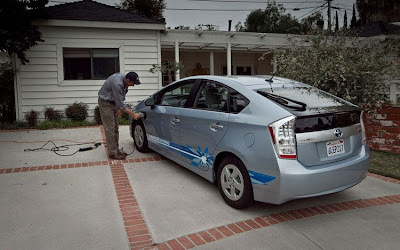 The Prius v wagon averages 42 mpg and the plug-in Prius, able to go as far as 15 miles on electricity alone, is rated as getting 95 mpg-equivalent when drivers frequently recharge the lithium-ion battery pack, according to the EPA.